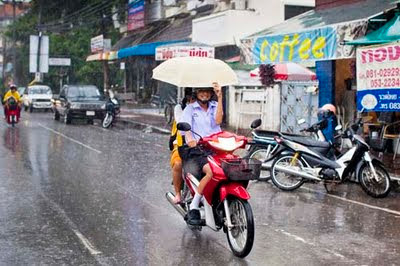 We're in Chiang Mai and it's raining. A lot. Not as much as it did when we were in Bali last year, but a lot more than it normally does here, even in the rainy season. I made this photo while we riding in a pickup truck on our way to a cooking class. There are more photos from Chiang Mai in my archive. They are available from ZUMA Press.